I have been employed at Dudley by Summit Healthcare for a relatively short time. However, I do bring to the group many years of transferable knowledge and experience as an Engineer and Facilities and Estates professional in both Healthcare and the private sector. Part of my day job is to act as the PFI interface between the Trust and all the different facets of our service provider Interserve. This includes Maintenance, Catering, Cleaning, Security etc. I also represent Summit at several Trust Operational meetings. I see part of my role of governor is to take the communication role a step further by ensuring a better understanding of the building, its capabilities and its infrastructure by all the building users and stakeholders. Additionally I would like to improve the communications link between the Trust and all the facilities support staff at the Dudley Group. I have worked for the Trust for twenty three years and now I am semi-retired. I work part time as a phlebotomist in the hospital and in the community. In my time as an employee I have heard good and bad reports and think as a governor I could give something back to the Trust. For eighteen years I worked at the Brierley Hill Health Centre. For two years of that I took on a HCA role also acting Practice Manager, which gave me a little understanding of the Trust and administration. I believe I would be a good asset to the Council using the knowledge and wisdom I have gained over the years and to help in any way to improve situations where a group get together is needed. I feel that I could help to improve The Dudley Group services for the whole of the Dudley community. I am committed to improving care and treatment over the whole community, in all areas. I have been working for the past 30 years for the NHS as a nurse in the Dudley area. For the last 17 years I was a JP (magistrate) in both Dudley and Wolverhampton, having retired in 2018. I was born, and have lived in Dudley all my life. I have a vast knowledge of the area, and I have a good understanding of people’s needs. I have good communication skill, and I am a good team member. I also have good problem solving skills. I have been a nurse for 32 years and worked at Dudley for the last 18. I am deeply committed to the organisation not just through my professional role but because this is my local Hospital and I have had family cared for with compassion and dignity on several occasions. Been a nurse and employee of the DGNHS FT as I have said means a great deal to me so when I had the opportunity to put myself forward as staff governor I did so immediately. This has given me the opportunity to give a nurses voice to the governors but also a personal opinion to what is our Hospital. Being Dudley born and bred my relationship with the trust initially began as a patient of the Russell’s Hall Hospital many years ago. Since 2009 I have held a professional relationship with the Trust, I am a Registered Midwife, Certified Hypnobirthing Teacher and I am also a Specialist Advisor for the Care Quality Commission (CQC). The NHS is under intense scrutiny and the demands to deliver High Quality Care have never been higher. Complex social and medical factors are on the increase meaning resources are often stretched making it extremely challenging to maintain safe, cost effective care. With a passion for service improvement and an interest in reducing inequalities in health, having a dual role within the Organisation (as an Employee and a Governor) allows me to deliver the Trust Values and share the Trust Vision with both patients and staff. The role allows me to maintain that crucial link for patients, staff and the Trust which I feel is pivotal to ensuring a positive experience for all. I have been a Dietitian for 35 years and worked in Dudley for 33 of these. 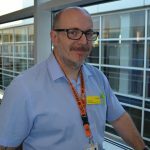 I am passionate about working in Dudley and being an Allied Health Professional. I feel honoured to represent AHPs and Health care scientists as a Trust staff governor. Allied Health Professionals (AHPs) and Health Care Scientists are a diverse group of highly trained autonomous practitioners that form a key part of multidisciplinary teams. AHPs and Health care scientists deliver high quality patient care; assessing, diagnosing, treating and discharging patients from primary prevention though to specialist disease management and rehabilitation. I strongly believe that multidisciplinary team working is important for best patient care and want to highlight and promote the role of AHPs and Healthcare Scientists in the Trust. My other love is food and providing patients with tasty nutritious food which they want to eat. This is important for patient’s recovery and to provide them with a positive experience of our Trust.